In the battle of the commercial vehicles, the new Nissan NV work van is quickly making a name for itself. Electricians, plumbers, delivery drivers and workers of all types from all over San Diego are finding the Nissan NV to be a reliable, rugged, versatile work van. It's also extremely customizable! Owners can get custom order their Nissan NV with an array of shelves, bins, rack and containers. The NV can even be configured to be everything from a passenger van, to a delivery vehicle or even a rolling office - complete with desk workspace! This gives the Nissan NV big advantages over competing commercial vehicles- including the Mercedes-Benz Sprinter, previously known as the Dodge Sprinter. 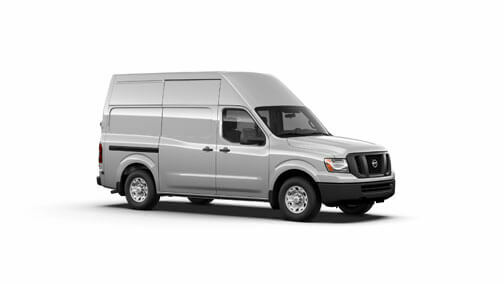 Here's how a well-equipped Nissan 2013 NV3500 HD SV High Roof Cargo Van compares with a top of the line (but much more expensive!) 2013 Mercedes Sprinter High Roof van. With a base model MSRP starting at around $11,000 MORE than the base model Nissan NV* the Mercedes will definitely make a big dent in your wallet. That means you'll be putting in plenty of overtime to pay for that fancy Mercedes hood emblem! When it comes to horsepower, the Nissan NV will be able to pull heavier loads than the Mercedes-Benz Sprinter. The Sprinter's 3.0L engine puts out a paltry 188 hp. The Nissan NV Cargo?s powerful 4.0L engine delivers 261 hp., and the NV Cargo's optional 5.6L V-8 engine provides a whopping 317 hp. For such a large van, the Nissan NV has a very small turning radius! On a fairly narrow street, the Nissan NV can do a complete 180 without having to back up, impressive considering the NV boasts a 146.1-inch wheelbase and measures more than 20 feet from stem to stern.